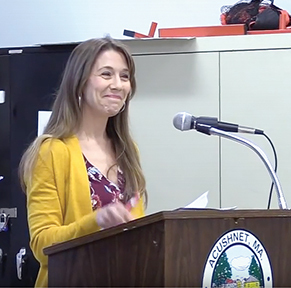 Acushnet Citizens Improving Our Neighborhoods (ACTION), sponsored its 40th candidates night on Thurs­day, 3/21/19. All candidates were invited, but only the two Selectboard candidates and School Committee incumbent Jennifer Downing participated. Members of the public also attended at the Senior Center, and were invited to ask questions, or submit questions in writing for moderator Thomas Hunt to read. Candidates were allowed to give an opening statement, answer questions, then give a closing statement. ACTION’s John Howcroft opened and closed the proceedings, telling the public that candidates nights and similar events have assisted the town in “some good decision making” over the years. He said he could not “over-emphasize” the importance of voting. “It is imperative for the future of this community,” he said, and for future generations. He said some of the issues in this year’s election will decided the outcome of issues that will affect generations. Saying he might not make it to the 41st, Mr. Howcroft added: “Let’s make the best of it,” and make this year’s election a good day with a high percentage of voters. The local town election is on Monday, April 1. Polls are open from 10 a.m. to 8 p.m. All precincts in Acushnet vote at the elementary school on Middle Road. Ms. Downing, running unopposed for re-election to her seat on the School Committee, told voters she is proud of the quality of Acushnet Schools. She has two children in the elementary school. She said when re-elected she will continue working hard to address issues affecting children, overall development, and continue the quality that Acushnet schools are known for. Her job as Executive Director of Leadership Southcoast keeps her “plugged into” a broad variety of regional issues and trends she said, and has helped her develop relationships and connections with leaders in the region. She faced no questions from the public. Mr. Desroches said he does not believe the town has gone far enough to tackle the problem. The over­whelming comment he got while campaigning was taxes and how the money is being spent. He noted that 91% of the tax base comes from the residential sector, yet his opponent voted to change the tax shift on residential/commercial taxes, that would result in an increase to homeowners. He said, although he was in favor of attracting new businesses to town, the tax rate between residential and business properties should stay the way it is. 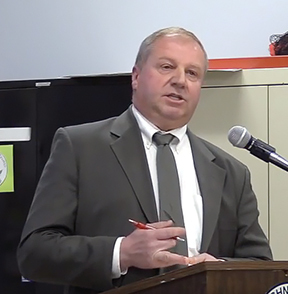 Dave Desroches, challenger for a seat on the Acushnet Selectboard, speaks at the annual candidates night on 3/21/19. Photo from Acushnet Cable video. “This town already pays some of the highest taxes in the area,” said Mr. Desroches. He also said he did not favor removing the Police Chief position from Civil Service. He said it will make it easier for the town to hire outside of the department. He said he realized he was the “new kid on the block” (okay, maybe the old kid, he added), so there were some things he could not debate. But, he said, sometimes “longevity” leads to “complacency” and just kicking the can down the road, leading to stagnation. “We need to be proactive, not reactive in plotting our town’s future,” said Mr. Desroches. He said he has been watching the Selectboard meetings and is “very concerned about the dynamics of the board” and how it affects their ability to work together. “I believe my election to the board would bring a steadiness that is lacking today,” said Mr. Desroches. Responding to questions from the public, Mr. Desroches said he came to his decision about the Police Chief position after meeting with Chief Alves for more than an hour. He said they discussed many details, including the possibility of creating a deputy chief position. To reduce the budget deficit, Mr. Desroches said that he would work more closely with the Finance Committee to identify where changes can be made. He also said he supported the senior work-off program, that gives part time, town jobs to senior citizens in exchange for a tax break. In his closing statement, Mr. Desroches made a plea to voters to get out and vote. Mike Cioper, running for re-election to the Acushnet Selectboard, speaks at the annual candidates night on 3/21/19. Photo from Acushnet Cable video. Incumbent Mike Cioper face a couple of pointed questions from the public. In his opening statement, he noted he is a lifelong resident of Acushnet and is raising his children here. 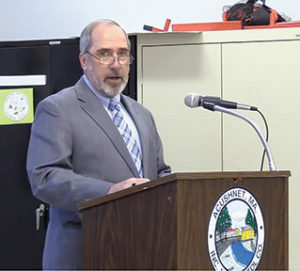 He said he had 32 years of “serving this great community” in a variety of capacities: as maintenance mechanic at the Acushnet Housing Authority, and in a variety of elected and appointed positions, including Board of Assessors, Conservation Commis­sion, Growth Management Commis­sion and Selectboard. “I’ve demonstrated sound con­serva­tive values and continue to share my love for this community,” said Mr. Cioper, adding that he prides himself on volunteerism and is a 24+ year member of the Lions Club. He said he wants to move the town forward and has learned an impor­tant lesson: “We must spend wisely, only on our needs, not our wants. He said he would continue the renovations at the Parting Ways Building, at “minimal cost to tax­payers,” implement the comprehen­sive wastewater/sewer plan, and continue to support local farmers and farmers markets, the town’s agricultural roots. 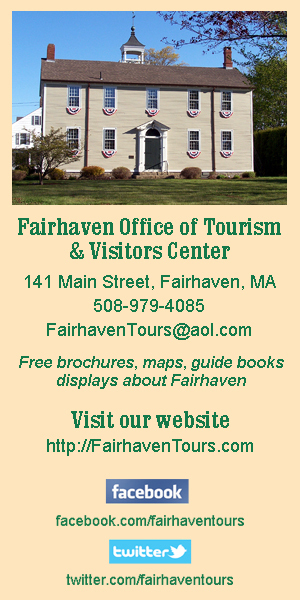 “I have always acted in the best interests of the town believing that the Selectmen are not only the town’s leaders, but the caretakers of the town and its people,” said Mr. Cioper, adding that officials are elected to protect the rights of people and ensure services or residents. He said the change would give them “greater flexibility” to hire within, not less. As for the budget deficit, he said it was not as large as mentioned, and that he believed it would be a balanced budget submitted to town meeting. He said the town is negotiating the insurance contract and employee contracts, and believes it will result in “substantial savings” to taxpayers. Mr. Cioper said hiring a new Town Administrator and Town Accountant/ Treasurer has helped with the process. He said it was “very conservative” and was friendly to the town and to employees. Asked why so many longtime town employees are leaving and if he thinks there is a morale problem, Mr. Cioper said they are leaving because they are underpaid. The W&C will bring the town up to the same standards as other communities. Police officer Chris Redmond pressed Mr. Cioper on his support of removing the chief’s position from Civil Service. Mr. Redmond said Civil Service takes the politics out of hiring. “[You’re] taking politics out of one thing and potentially putting it into another thing,” said Mr. Redmond, adding that it seemed that the intent was to take the job out of the department and hire someone from outside of town. “That’s not my idea at all,” said Mr. Cioper, adding that he felt they had great candidates in the department. In his closing, Mr. Cioper recapped the accomplishments of the board in the past three years, especially that they have combined some jobs in town hall and negotiated some “good contracts,” all saving the town money.